The Richard Montgomery was a Liberty Ship, one of hundreds manufactured on a high-track production line during World War II to replace a fleet of cargo ships falling prey to the German U-Boat wolf packs on the North Atlantic. There was a flaw in the design of the Liberty Ships, a weakness in the keel that caused some of their hulls to crack when hitting an obstruction. When it happened, the vessel could break in two and sink. The 440-foot Montgomery, with a crew of 50 plus 30 gunners, steamed from Philadelphia with 6,000 tons of munitions on board, headed for London for use by the US Army Air Force. The cargo included 12,064 general purpose 250-pound bombs, 9,022 cases of fragmenting bombs, 7,739 semi-armor piercing bombs, 1,429 cases of phosphorous bombs, 1,427 cases of 100-pound demolition bombs, 817 cases of small arms ammunition and over 1,500 cases of fuses. The Montgomery arrived safely in London and was anchored on the Thames estuary, apparently waiting to unload cargo at one of the busy piers. But something happened on the night of Aug. 20. The vessel broke away from her moorings and ran aground on a sand bar in the middle of the river. The pressure from the sand bar on the keel caused the ship’s plates to buckle and crack. The crew abandoned ship. A special team was brought in to remove the cargo. The Montgomery’s own booms and winches were used to hoist the heavy cases from the cargo holds to waiting lighters, or flat-bottomed barges. 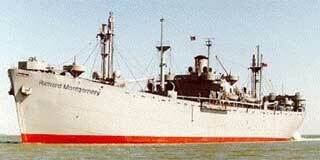 The salvage work progressed for several days before a storm caused the Montgomery to break free. One in deep water she broke her back, broke into two sections and sank in the muck. 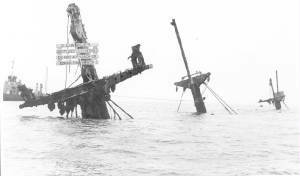 The wreck still rests there today, laden with an estimated 1,400 tons of TNT. All of this was recently made public by a story published in New Scientist, based on a report commissioned by the UK government. The story says the wreck, which is still partly visible with its masts and booms still protruding above the water line, is a ticking time bomb that could explode with enough of a destructive force to put everybody in the City of London in great peril. That the bombs are under water within the wreck is no safety valve, the report said. Dynamite becomes increasingly unstable as it ages, and a slight jar, perhaps from the collapse of a part of the rotting steel hull, could trigger a blast. The wreck is disintegrating as it rusts and engineers estimate it will begin collapsing within ten to twenty years if not sooner. The report said removal of the explosives at this time would be so dangerous that it would require a special team of specialists. Also it was recommended that an estimated 40,000 people within the potential blast area be evacuated from their homes and businesses until the work is completed. It is estimated to take about six months for the explosives to be removed. One suggested solution would be to build an 1800-meter earthwork around the wreck to absorb the force of the inevitable blast.